BCT is more beneficial than mastectomy for some patients. Researchers assessed survival in the Netherlands in almost 130,000 patients with breast cancer. Patients were divided into 2 groups based on when their breast cancer was diagnosed: between 1999 and 2005 and between 2006 and 2012. Selected patients experienced no metastases, and data were connected to cause of death register. Randomized trials in the 1980s indicated equal survival for BCT and mastectomy; however, the trials frequently exclude older patients and patients with other comorbidities. Studies that include large, population-based groups that include comorbidities and older patients could better elucidate more widely applicable outcomes that better reflect clinical reality. This study accounted for prognostic factors such as age, disease stage, hormonal receptor status, HER2 status, comorbidity, and differences in treatments after surgery. “We looked at 2 different groups in order to allow us to compare long-term outcomes in a more historical versus a more recent cohort, evaluating patients that had been able to benefit from more sophisticated diagnostics and therapies,” explained senior author Sabine Siesling, PhD, from the Netherlands Comprehensive Cancer Organization. Researchers divided each time cohort into subgroups to determine which patients benefit most from BCT. Patients with cancers that were T1-2N0-1M0 showed significant benefits with BCT among the elderly, those with comorbidity, and patients who did not undergo chemotherapy. This was true for both time cohorts. 1. Lagendijk M, van Maaren MC, Saadatmand S, et al. Breast conserving therapy and mastectomy revisited: breast cancer-specific survival and the influence of prognostic factors in 129,692 patients. Paper presented at: European Cancer Congress 2017; January 27-30, 2017; Amsterdam, Netherlands. Abstract 4LBA. 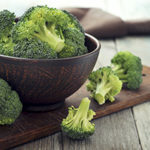 Might a Chemical from Celery and Broccoli One Day Yield a New Drug to Prevent Breast Cancer Metastasis?